Unpopular and scandal plagued, what legitimacy does Brazil’s interim government have to impose painful cuts? Brazil’s interim government, led by former vice president Michel Temer, is facing a serious credibility crisis. Two ministers were dismissed in the first few weeks after leaked audio appeared to show them conspiring to stifle the ongoing Petrobras corruption investigation. Meanwhile, Temer’s administration is trying to pass a budget through congress calling for limits on health, education and social spending, defended as bitter but necessary measures to get Brazil’s flailing economy back on track. But what legitimacy does Temer’s unelected government have to impose cuts that will seriously affect tens of millions of mainly poor and lower income Brazilians? Temer’s rise to presidency illustrates Brazil’s acute political dysfunction. More than two dozen parties form often flimsy favour swapping coalitions to gain and maintain power. Temer’s Brazilian Democratic Movement Party (PMDB) – of no fixed ideology that historically latches onto whoever is in power – was allied to President Dilma Rousseff’s left leaning Worker’s Party (PT). Hence how Temer became vice president. Weeks before Rousseff’s first impeachment vote, after a 13 year coalition in which the PMDB gained coveted ministerial positions, the party split from Rousseff’s government, essentially allying with the opposition. Temer, by all accounts, played an active role in Rousseff’s downfall. Rousseff and her supporters call the impeachment process a “coup.” Accused of manipulating government finances to hide a growing deficit ahead of her 2014 re-election, she is currently suspended and awaits impeachment trial at the senate that will most likely lead to her permanent ouster. Whether Rouseff’s impeachment constitutes a coup or not is widely debated. However dubious, it happened through a legal process. But now, unpopular and otherwise unelectable Temer is pushing through reforms to roll back Brazil’s social safety net, measures that clearly wouldn’t receive popular support through vote. Data polls suggest 60 per cent of voters wanted Rousseff impeached, a weak president and poor manager, who presided over Brazil’s worst recession in decades. Yet only 2 per cent would actually vote for Temer and 58 per cent wanted him impeached too. In fact, 60 per cent want new elections, only plausible if Temer resigns or is forced to stand down. Temer could be impeached on the basis that as Rousseff’s vice, he also broke budget laws. He could also be removed by the electoral court if it’s proven that his and Rousseff’s election campaign received funds from construction firms embroiled in the Petrobras scandal. So far he has been mentioned in plea bargains relating to the scandal but nothing has stuck. However, Marcelo Odebrecht – chief of one of the main firms involved – has reportedly signed a long awaited plea bargain, which could see many more heads roll in Brasilia. Temer called for a “government of national salvation.” He famously installed a conservative leaning, all white male cabinet; burying Brazil’s ideal – however illusionary – of being a “rainbow nation” or “racial democracy.” What’s more, at least a third of the chosen ministers are accused of corruption. Within a week, ministers were talking about shrinking the health system and saying no constitutional right is absolute. Temer even had to warn them to think before speaking. The scandalous audio leaks began with planning Minister Romero Juca apparently discussing Rousseff’s impeachment as a way to stop the Petrobras investigation. He was suspended. Next, Temer’s anticorruption Minister Fabiano Silveira stood down after audio revealed him giving advice on dealing with prosecutors to senate president Renan Calheiros, a powerful honcho of Temer’s PMDB party, target of multiple investigations. In the middle of the leaks, the budget that involves cuts to health, education and social spending to tame the country’s ballooning deficit, was outlined. Brazil’s economic crisis is already corroding the significant gains made by Rousseff’s Worker’s Party. Under her predecessor’s watch – the popular Luiz Inacio “Lula” Da Silva – millions rose from extreme poverty. In 2014, Brazil was removed from the world hunger map. A fall in commodities prices, the paralysing corruption scandal at state oil giant Petrobras and Rousseff’s unsuccessful macroeconomic policies saw Brazil’s economy shrank by 3.8 per cent last year, with similar predictions for 2016. All three of the main ratings agencies have reduced Brazil to junk status. Millions have fallen back into poverty, with unemployment at 11 per cent and over a 1.5 million jobs lost in 2015. Temer’s so called government of “national salvation” want to implement an austerity programme outlined in his party’s “Bridge to the Future” report, that advocates increased privatizations and public spending limits. As well as cuts to health and education, Temer’s government hopes to scale back Brazil’s landmark social welfare programme “Bolsa Familia” by at least 10 per cent. The programme awards poor families a small cash stipend for keeping kids vaccinated and in school. Far from perfect, the programme costs just 0.5 per cent of GDP and reaches 47million poor Brazilians. More cuts are expected to be announced in the coming months. While such public spending cuts will hurt poor and lower income families, critics say they won’t make much impact on Brazil’s deficit, targeted at US$48 billion for 2016. Brazil is not Venezuela. It remains the world’s 7th biggest economy with around US$360billion in foreign exchange reserves. Prices of commodities like iron ore and oil, which feed the economy, are on the rise again. IMF Brazil director Otaviano Canuto pointed out in an interview with BBC Brasil that there is plenty of opportunity to increase taxes on the wealthy, something that no government, including the Worker’s Party, has ever approached. Brazil’s taxes on the rich are the lowest in the G20. Tax avoidance in Brazil was recorded at more than US$117 billion in 2015, more than twice this year’s fiscal budget deficit target. Meanwhile, Brazilian company JBS, the world’s biggest meat company has moved its base to Ireland meaning it now doesn’t have to pay tax in Brazil. Temer’s finance minister Henrique Meirelles was a former chairman. 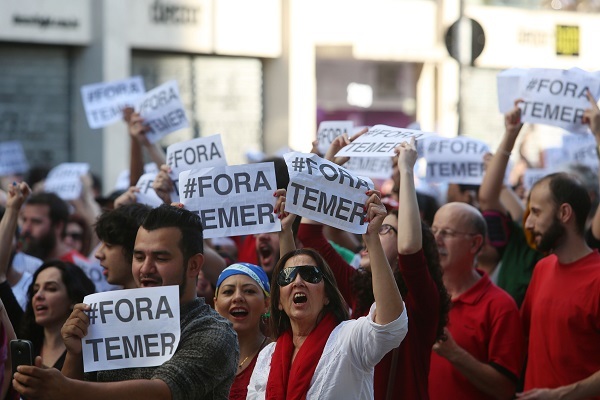 Resistance to the Temer government on the streets so far has been visible but lukewarm. Temer’s justice minister Alexandrae Moraes – whose Sao Paulo military police fired 48 stun grenades in 6 minutes at a bus fare hike protest earlier this year – promised to crack down on dissent upon taking office. Social movement leaders say that they don’t recognise Temer’s government and promise to resist. In a small but symbolic victory, the ministry of culture was reinstalled following occupation, having been cancelled by Temer. Many view Temer’s government as illegitimate. This sentiment may grow with further damaging audio leaks and sleaze allegations and if the economy doesn’t improve. 2 Responses to Unpopular and scandal plagued, what legitimacy does Brazil’s interim government have to impose painful cuts? THAT WAS THE CIA COUP. They had their man in there, and waited until they seized enough positions, THEN they swooped. Rousseff should do more than telling her people that she is a victim of a coup. She should give speeches and lead demonstrations, mobilize her people and go to prison if necessary. Otherwise she would be a lost case. Sam Cowie is a British journalist based in Sao Paolo, Brazil. He is a regular contributor to Al Jazeera English online, The Guardian, The Sunday Times, Deutsche Welle and BBC. He has been covering Brazil on and off for nearly five years covering all the big stories including the current political crisis. He has also reported from India, South Africa, Paraguay, Mozambique and Swaziland.